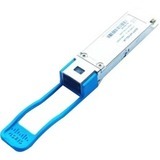 The Cisco 40GBASE-CSR4 QSFP+ Module is similar to the 40GBASE-SR4 interface extends supported link lengths to 300m and 400m respectively on laser-optimized OM3 and OM4 multimode fiber cables. Each 10-gigabit lane of this module is compliant to IEEE 10GBASE-SR specifications. This module can be used for native 40G optical links over 12-fiber ribbon cables with MPO/MTP connectors, or in 4x10G mode with ribbon to duplex fiber breakout cables for connectivity to four 10GBASE-SR interfaces. Maximum channel insertion loss allowed is respectively 2.6dB over 300m of OM3 cable or 2.9dB over 400m of OM4 cable.